A carb-lover's dream, this sandwich gets stuffed with flaky pie crust. Simit-pogacha is a beloved breakfast food in Skopje, the capital city of the Republic of North Macedonia. Bakers slice open a bun, stuff it with burek—a pastry crust of layered phyllo—and serve as a sandwich. No meat, no cheese, no sauce. Just bread. Burek is typically stuffed with feta cheese, greens, or meat. However, the burek that goes into simit-pogacha is just the plain, flaky crust. Depending on where you buy it, the crust can be housed inside sesame buns or warm, fluffy rolls. Either way, diners almost always wash down the greasy, comforting carb combo with drinking yogurt. 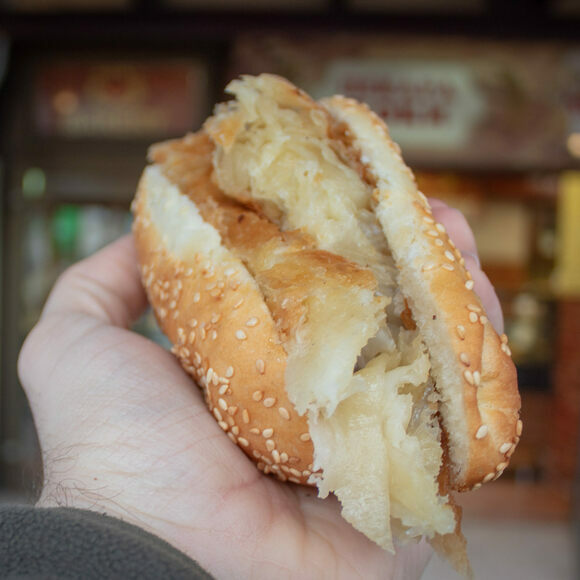 If you leave Skopje without at least trying simit-pogacha, you’re missing the city’s soul. The sandwich doesn’t have much flavor and can be dry without the lubrication of the yogurt, but its comforting carb-on-carb composition makes it a morning must for many Skopje citizens. In addition to simit-pogacha, they have burek (try the feta crust variety), pizza, and really good lasagna. This fruit either burns your throat or tastes like a tropical medley. At last, a street snack that brings together Doritos, veggies, pickled pig skin, and gummies. This ancient agave elixir won't get you drunk, but it might immobilize you. A very non-vegan dish inspired this vegan chocolate.